Martha’s Vineyard is a 100 square mile island off the southern coast of Cape Cod, and is often known simply as “the Vineyard”. On a yacht charter out of Newport, Rhode Island, Martha’s Vineyard is a popular stop and as the largest island in southern New England, it is not hard to spend several days enjoying all that this quinsentential New England Island has to offer. This idyllic summer haven was once an important commercial center, with whaling and fishing as the main occupations, in the 18th and early 19th centuries. 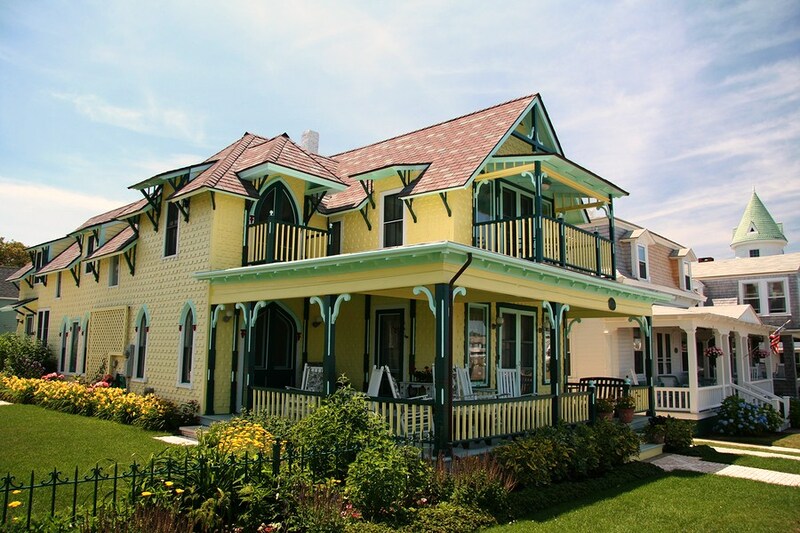 In the late 1800’s the island, with its harbors, beaches, and scenic attractions, developed into a summer resort. It is divided into the towns of Chilmark, Edgartown, Gay Head, Oak Bluffs, Tisbury, and West Tisbury. Much of the island’s interior is set aside as a state forest. However it is the coastal towns that the visiting yachtsman can most easily see, simply by sailing into the harbors. Wealthy Boston sea captains and traders formerly built large homes on Martha’s Vineyard and today the Vineyard has become one of the country’s most prominent summer havens, attracting Presidents, politicians, musicians, artists and actors. This makes people think of the island as glitzy, which is not the case. It is, rather, intentionally rustic with T-shirts and flip flops more the norm. The real charm of the island lies not only as a tourist recreation destination but also as an escape from daily concerns enjoying the laconic summer days at the relaxed pace encouraged as an island lifestyle. 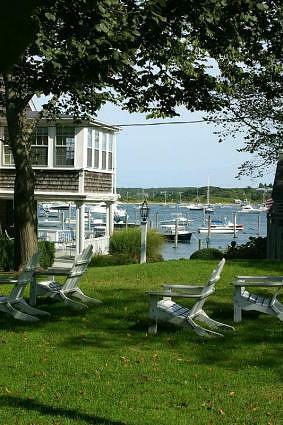 Edgartown, the most popular town on the island is a 22 nautical mile sail from Nantucket and a 48 nautical mile sail from Newport, Rhode Island, a popular starting location for a summer cruise of the southern New England Islands, or a yacht charter of the same. 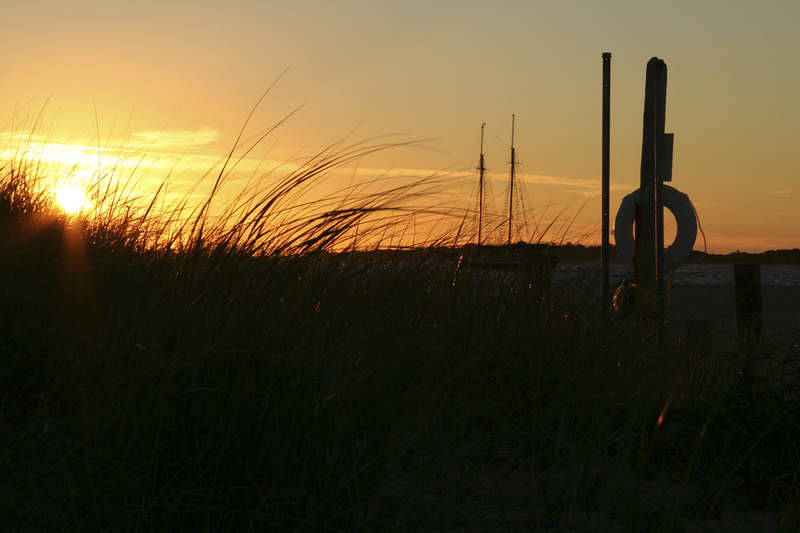 The Edgartown Yacht Club sits as a welcoming beacon at the opening of the harbor after the Chappaquiddick ferry landing, and hosts a popular sailing regatta every summer. Named after the young son of King James II of England that died in 1671, Edgartown has been in existence since 1642 with historic buildings clustered along cobbled streets many featuring the famous New England architectural feature of the Widow’s Walk. The channel entrance by yacht into Edgartown opens into Katama Bay, which is a large bay with mooring balls and some anchorage for visitors. There is very little dockage, and most yachting visitors use a mooring ball, which can be reserved in advance, and either the ship’s tender for shore access or the harbor launch or water taxi service. The south end of Katama Bay has a barrier beach that sometimes connects the neighboring island of Chappaquiddick to Martha’s Vineyard. In 2007, a storm blew a hole in the barrier beach disconnecting Chappaquiddick Island from Martha’s Vineyard, and causing a 3 knot current to now run through the harbor. Only yachts up to a certain size can actually access Katama Bay. Those larger must anchor outside of the channel entrance into the bay. 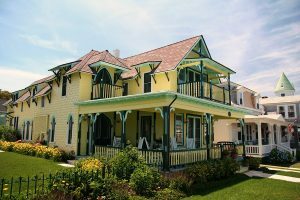 The Vineyard is a well known African American resort stemming from a history of racial harmony on the island when black families started vacationing there a century ago. Oak Bluffs is the center of the Vineyard’s black culture. 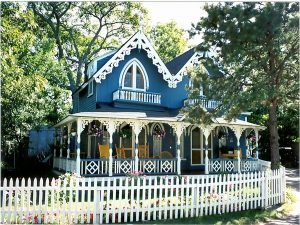 The Methodist Church sponsored summer meetings in Oak Bluffs starting in the mid 19th century that became so popular that soon permanent little summer houses were built. 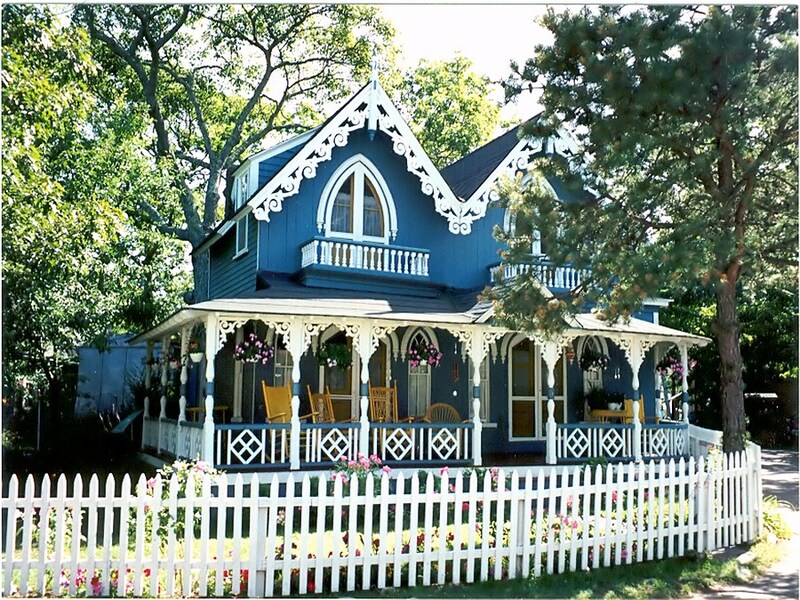 These little cottages that number in the 100’s are now called Gingerbread Cottages due to the ornate trim work and almost doll like size that many feature. A number are still passed down within the original building family. As the largest of the southern New England islands, you may want to cruise from harbor to harbor, visiting the three main towns on Martha’s Vineyard of Edgartown, Oak Bluffs, and Vineyard Haven, or tour the island by car or bicycle. 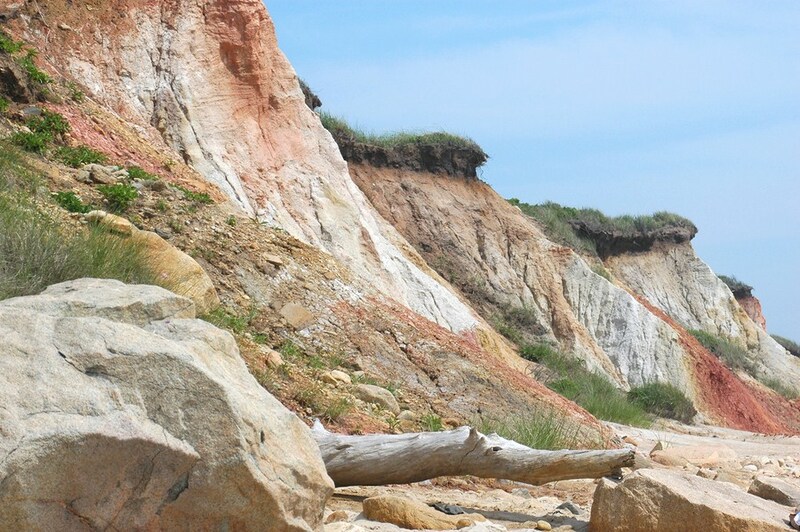 Just like the other islands in southern New England, Martha’s Vineyard has miles of beaches, blooming wild beach roses and hydrangeas, and for the tourist business, which is very important to the island, many unique and different boutiques offering something for everyone. It is easy to spend several days on or cruising around Martha’s Vineyard on a cruise or yacht charter of these southern New England Islands.Contact Northrop and Johnson For More Information!